Joseph Scaletti touched many of our lives in many ways. Please share your reminiscences, personal anecdotes, and stories here. And a toast right back to you, dear Joe. May you continue to inspire those of us you left behind and to soar throughout eternity. I miss you. My deepest condolences to you and your families. My Uncle Joe was a great man and will be missed by many, but his legacy will carry on forever. I fondly remember Uncle Joe and Aunt Rita coming to visit my grandmother in CT and always looked forward to their visits. You could tell from their interactions with each other that they were truly each others soul mates. Remembering the dinners that we would have at gram’s, what always amazed me about your dad was his calm demeanor – so much different than the rest of our family. You could sense the passion that your mom and dad had for education and they always asked me about my classes, what I was studying and how I was doing in school. I respected their concern and advice and their visits always left me motivated to study and work harder. May God bless both your mom and dad. Dr. Scaletti’s leadership & contributions to improving health of rural New Mexicans has been incredible. His work with the Rural Health Interdisciplinary Program for 14 years set the stage for his work with ECHO. We will all miss his devotion. He was a gentle and good soul who worked, “not for glory …and least of all for profit,” but to make this world a better place for his children and for all of us. I saw Dr. Scaletti having lunch at a restaurant recently. I watched him, reading a magazine and enjoying his lunch, and felt a great deal of respect for his choices, his strength, his independence. I can only hope to leave this world the same way, on my own terms, and leaving a powerful positive legacy behind. Bravo Joe. who was a dedicated arranger. Joe Scaletti was Dr. Interdisciplinary on a national basis. That a basic scientist could capture the significance to the practice of medicine of interdisciplinary care was an amazing achievement. To become a significant part of the interdisciplinary education culture nationally brought a great deal of recognition to the University of New Mexico. HRSA loved him because he produced the data, in true scientific fashion, of a successful federal program that produced a measurable product every year for 14 years. Even the US Government could not say no to Joe. What a pleasure it has been to have worked with Joe for over 40 years in his service to UNM and to the UNMHSC. He has had so many roles, so many responsibilities,and so many ways in which he influenced and supported students, faculty, staff, patients, and colleagues over these years. This was his world, and he loved it dearly to the absolute end. Each of you have been important to his happiness and satisfaction over the years, and most particularly over these recent ECHO years. Your kindness and willingness to share with him your dreams and hopes for improving the lives of patients across the state has given him great joy. It is a wonderful thing to have shared his life with him for all of us over these years. His efforts will be continued through all of our efforts as a living memorial to his commitment to students and patients and colleagues. His life has certainly been a celebration! Let us keep up the great things of which he has been a part! Every 4th Tuesday of the month I look forward to going north for our ECHO Partners meeting regarding Hepatitis C. It’s all about being with good people for great cause. I always tried to travel the 225 miles from Las Cruces at consistent pace so I could arrive a few minutes early to speak briefly with a special person. Joe was that person for me, too. He had a keen interest in our DOH Hepatitis C toll free hotline and how to promote more HCV awareness statewide. He shared my appreciation for data to demonstrate our performance effort and results. In the last annual ECHO get-together at Dr. Arora’s house in the summer past, I invited my daughter Sofia Luisa and husband Ben to accompany me. She is in her first year of Graduate Physician Assistant Studies at the University of St Francis in Albuquerque; he is a first year law student at UNM. I made a point that they had an opportunity to talk with Joe. His inspirational comments and encouragement were exactly what I had expected and hoped for from a man of his character. I really think my daughter wants to get her PhD in biology too. So no better role model than Joe of course. 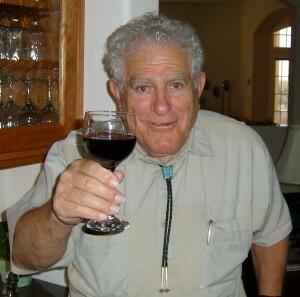 Finally, I must say that I regret that I never had a chance to drink a glass (or two) of red wine with Joe as his photo in the Reminiscences section of his Website shows. However, no doubt I will remember him often over the years as I raise a glass of my favorite beverage and toast to his spirit of humanity and service for the poor and underserved of New Mexico. Joe and Rita were great neighbors for over 20 years. We shared meals, wine, bridge, golf, and stories about our kids and grandkids and about his work and ours. Couldn’t ask for a finer couple as neighbors and friends. We will miss Joe as much as we have missed Rita. I knew your dad for 40 years, dating to 1969 when I joined the faculty at the School of Medicine. For 25 years, I was on the Research Allocation Committee, chaired all those years by your dad. Many new young faculty were assisted by funding from that Committee to start their research careers. Most of them never knew the special role that your dad played to assist new faculty. I also collaborated with Joe in several research projects and published several papers with him. As stated on the obituary published in the Albuquerque Journal, Joe was an idealist. He was tireless when it came to encouraging others to pursue new ideas and was always available to help. You can be especially proud of your dad. He really was special. We are still having a very hard time believing that Dr Scaletti is no longer with us. I can only imagine how profound this loss would be for you and family. Jyotsna and I would like to express our deep felt condolence and sympathy with you and family. After spending time with him, it has been my genuine wish to be a caring husband, father and above all a great human like him. While I really appreciate all the ECHO staff for making our stay one of the most memorable ones, Dr Scaletti was a real attraction for my kids (Arnav was 2 years and Sneha was 8 months then)… Arnav used to call him “Dr Scaletti Uncle”… we used to long for those weekends to spend with him… it was such a fun… Arnav used to speak with him in Marathi (our local language) and Dr Scaletti would talk to him in English! But the bond that we shared with Dr Scaletti made us realize “love really goes beyond any language, country”. And it is this greatness of him that will be with us forever… so though we have lost him, he still will be alive in our hearts and memories. He used to talk a lot about both of you. Carla, he told us so many times about the “A R Rahman episode”… he was really so proud of both of you. He has left a great vacuum in our lives. He will be missed a lot but I think he lived a great and fulfilling life… he has touched and changed so many lives and philosophically speaking that is what really matters of our lives. My son Arnav enquired about Dr Scaletti yesterday again and I just told him that he is little too far to meet …. Arnav has cherished those lovely memories and what else a father like me would expect? We want you to know how much we will always remember your Dad with such love and admiration. Although his visits back East were not frequent, they were memorable. When Mom would tell us that your folks were coming, we knew that the visit would be loving and as well as interesting. They were both one of the kindest, loving individuals that we had the honor of knowing. I understand that they will be united forever with the blending of their ashes, and I think that is the most romantic devoted gesture. We will miss his visits as we missed your Mom’s presence when he came alone. I remember one trip when Ron and I picked him up from the Providence airport and the hour trip felt like a few minutes because he entertained us with stories from the past. Ron and I particularly remember the African Honeyguide story from his first subscription to National Geographic that you referred to on this website. We remember him telling us that when he left there he did not know if he had just opened or closed the doors on his admission! Well, we all know how that turned out!! Well, I’m shamefully “angry” because I wished we could have had just one more visit from him here or that we could have made it out to New Mexico. Last November when my SiSi Dolores died (my Mom’s sister) the priest told us we must not punish ourselves for feeling … “if only we had spent more time…” So I guess we will try but I know that we will always wish that we had just one more visit. So please know that we mourn with you and are thinking of all of you and our Sweet Uncle Joey. Joe dedicated his life to research for the betterment of others’ quality of life. His goal in life was helping others. Certainly Joe’s contributions to medicine are far reaching. They are his awe-inspiring legacy. Joe loved people and in return people adored Joe. Joe was so vibrant and caring…he was truly interested in other people’s lives. We considered Joe part of our family—our entire extended family loved him dearly. We will carry cherished memories of Joe in our hearts forever. He is dearly missed. Please know we share your significant loss and that our hearts reach out to you. I just wanted to let you know how sad I am to hear of your father’s passing. I have to say that I am devastated by this. Joe was one of the people who recruited me to UNM, and was a visionary. I remember when he started the South Campus Research Park, people predicted it would fail, and 22 years later it is still going strong with some of the greatest research labs on the campus. He also played an instrumental role in establishing CNID, which morphed into the MIND, and which is now as the Domenici Research Labs – one of the premier facilities on the HSC campus. But most importantly, he was a great guy. He was proud of his role in the establishment of telemedicine at the HSC. I remember one summer evening he and your mother, and Bob and Helene Glew were having dinner, and my wife Ruth was out of town. They invited me to join them at Trombino’s. We had a great time, and your father ordered some very nice chianti that was absolutely wonderful. After dinner, your mother and father invited us over to their house, and we sat under their patio lattice covered with grape vines, full of grapes, and we talked and laughed into the late evening. It was one of the most beautiful nights of my life. And, I returned home a sack full of the grapes. I am sure that there are many people at the HSC who don’t know who Joe Scaletti was or what he accomplished. But I feel fortunate to have known him and enjoyed his company and his counsel. I just wanted to let you know that there are people at UNM that have admired and cherished Professorre Scaletti. When a major professor dies and the student himself is past the normal retirement age, it seems only fitting that there be some time for reflection. So, please bear with my self-indulgence in these reminiscences. To start the adventure, New Mexico was a wonderful and exotic place, especially for a nice midwestern boy who had grown up with the Norwegians in Minnesota, the Dutch in Michigan, and the Poles in Wisconsin. Even now I remember the New Mexico years fondly and as one of the high points of my life. Scientifically and educationally, I, along with John Safford and Frank Casey, made up the first class of Ph.D. students in the UNM Department of Microbiology (now the Department of Molecular Genetics and Microbiology). Our first labs were in a “temporary” and loosely constructed steel building that was still there and in use 25 years later. After each springtime dust/sand storm, everything was covered in dirt – lab benches, desks, chairs, shelves, window sills, reagent bottles – everything. We must have been pretty good microbiologists; after cleaning up, even in that building we never had serious contamination problems with our cultures. After two years we moved into proper labs in the “new” building; the labs were nice but definitely lacking in character. In the lab, I worked with Joe on a bacteriophage problem. We collaborated, we contended, we agreed, we argued, he pushed me, I pushed him, and after three years he sent me out into the world. It now is 40 years since I left Joe Scaletti and UNM, and the adventure continues. During that time I have held a series of academic and research appointments at the University of Minnesota, University of New Orleans, Louisiana State University Health Sciences Center-New Orleans (from which I “retired” in 1999), Center for Applied Microbiology and Research, Salisbury, UK, Institute for Dental Research and University of Sydney, Australia, and the University of Georgia (where I am easing into a second retirement). Throughout all this time, I have been indebted to Joe Scaletti for illustrating for me three principles. First, ask simple scientific questions even if they challenge what everybody knows to be true. Joe had a gift for pointing out which perceived scientific truths in fact were not supported by data. Another professor had a sign over his desk that read “Let dogma eat dogma.” Joe initiated several important studies by pointing out that the data supporting cherished dogmas were weak or non-existent. Second, be interdisciplinary. Your colleagues in other areas will help you to become aware of new and interesting problems and will contribute different perspectives and alternate points of view to your problems. You will do the same for them, and good things will happen. Third, while taking care of your scientific career, also pay attention to the problems and goals of the institution at which you are employed. Help to solve those problems and achieve those goals and, again, good things will happen. I can only hope that I have transmitted at least a bit of these principles to my own students. In the intervening years Joe and I were in contact from time to time – dinners at ASM meetings, a visit in Albuquerque, and exchanges of e-mails. I remember e-mailing my pleasure at seeing his name on a 2007 Project ECHO paper, and his reply that it was good that I was professionally active in my retirement. While writing this, I retrieved from deep in the schoolboy Latin section of my memory a line from an elegy by one of the Roman poets, “Ave atque vale” – “Hale and farewell”, to which I would add “Well done, Joe, and thanks”. I remember when My husband Paul and I first moved to Albuquerque, New Mexico 13 years ago. We didn’t know a soul. It was very lonely, until my uncle Joe and Sisi Rita asked us to come and spend Easter with them. My cousins Robert and Carla were there as well along with their families. This started a tradition and we finally had a sense of belonging. Some years later, we adopted our daughter, Bella. Joe and Rita were always loving and supportive of her and she took to them very quickly, as most kids did. Their compassionate hearts and love of children was evident to all. I remember when Bella took her first steps in life, Rita was there to catch her. I feel honored to have had the opportunity to spend part of my life with Uncle Joe and Sisi Rita. I love them and miss them both very much. Your father was quite a man….you follow in his footsteps. Margaret-Jane and I are blessed to know you, and in some small way, I feel like we know your dad. In 1993, I was hired by Gila Regional Medical Center in Silver City to coordinate a number of programs. One of those programs was the Locum Tenans Program in collaboration with UNM/HSC. This is where I met Dr. Scaletti. My role was to find preceptors for each student, a place for the students to stay, and provide information on local resources for the UNM students who would temporarily relocate to Silver City. Dr. Scaletti’s vision was to have providers and students work in teams and hopefully students would come back to rural areas to practice after they finished medical school. During each term, I would schedule a banquet inviting community leaders, UNM/HSC representatives, hospital staff and UNM students. This was a way to highlight the work and illustrate the impact on the community and hopefully incite the students to come back and practice there. When I left Silver City to return to Albuquerque, Dr. Scaletti wrote a letter of reference for me. This letter illustrated that he noticed and valued my work. Later after relocating to Albuquerque, as would I run into him on UNM’s north campus, he always had time to talk, he was always cheerful, pleasant and interested in whatever I was doing. My last conversation with him, at a Project ECHO convening, was about his views on health care reform and we also talked about the community health worker/promotora model. He was very excited about adding the the CHW component to the medical team. He was a wonderful man and will be missed by many. Please acccept my condolences on the passing of Joe. I knew him as a constant presence on the Health Sciences Center campus and as a cheerful and dedicated leader. Our interactions connected on interdisciplinary services. I have a great admiration for his role in starting the medical school and his constant tending to its needs and initiatives. My heart felt the deep loss of the passing of a great Man. I was first intoduced to him and Rita at our home in Isleta Pueblo at one of our feast days. At that time, Dr. Scaletti was mentoring my uncle, Dr. Michael Trujillo as he was in medical school at UNM, being one of the first Nativ’s to attend medical school. As a family and community member of a native tribe, we were skeptical of relations that would come into the family. However, after meeting and spending the day with food, laughter, stories, and extended family, I knew this man would become close to our family and would be one of honor. Sure enough, I had the pleasure to work with Dr. Scaletti directly in establishing the Office of Rural Health and the Interdisclinary program. We traveled to rural communities throughout NM and truly enjoyed the stories of family, children, gardening, and our deepest passion of rural heath care. Myself and my family extend our gratitute in his sharing of his energy and spirit. He was a true carrier of Honor and Wisdom in the Waconda home. I was deeply saddened by the passing of Dr. Scaletti. I used to scan the room at Rotary Club to get a seat next to him for lunch. He never refused my offering of a piece of pie, or my request to hear an interesting story, or about his work in this great state of New Mexico. ECHO brochures will be passed out to patients for their health, and will forever bring back fond memories of Dr. Scaletti’s wonderful smile and warm heart. He will be missed by all the lives he’s touched, but his legacy lives on forever. I only had the opportunity to work with Dr. Scaletti briefly on a couple of occasions and I remember enjoying his sense of humor. Thanks for putting together his biographical details on this site. This led me to read more about the honeyguide bird, which was fascinating. However even with today’s internet, I couldn’t find the answer to the question about a possible link between this bird and Tuberculosis. If any one has more about this, I’d like to hear it! Thanks for all your contributions, Dr. Scaletti. We are toasting you, Dr. Joe. Your style of teaching, your radiant/ kind personality, and your knowledge helped guide both of us through our careers and lives. You were a strong pillar of compassion and wisdom during medical school, pathology residency, and medical technology school. We were so fortunate to know you and be your students at UNM. We were so pleased to see you and your wonderful smile again, after many years, when we attended Andy’s (Dr. Robert E. Anderson’s) Memorial last fall. May God keep you and richly bless your family. Deborah C. Newman, M.D. & Christopher Krco, Ph.D.
Debbie and I were deeply saddened learning of the passing of Dr. Scaletti. He was a friend, advisor, mentor and father figure to us. Debbie was a student in Joe’s laboratory investigating molecular forms of mitochrondrial DNA in leukemic mice. Under Joe’s exemplary mentorship Debbie learned the art of scientific experimentation and writing. When Debbie entered medical school at UNM, Joe closely followed Debbie’s progress and took pride in his maturing student. When Debbie’s father passed away suddenly, Joe was there offering sympathy, support and encouragement. At graduation, Joe personally placed the M.D. hood on Debbie, a warm and caring gesture typical of Joe. While Debbie was in Joe’s lab, I was a Ph.D. student across the hall. Joe, ever insighful, quickly realized that Debbie and I were probably more than lab partners in one of his graduate lab techniques class and welcomed me into his extended lab family. I too greatly valued and appreciated his knowledge, demeanor, advice. Debbie and I felt that Joe and Rita adopted us. Their home was warm and comforting. I fondly recall times with Rita over treats in the family kitchen while Debbie and Joe went over data in his study. Debbie and I especially enjoyed sharing Thanksgiving dinners with Joe, Rita, Carla and Robert. One particular Thanksgiving was memorable. Joe planned to drive all of us to a cabin in Pagosa Springs for the holiday weekend. Joe mentioned that Carla would be practicing her music lessons so we should be prepared to hear her practice. The detail Joe omitted was that Carla played the harp and that the harp was given space priority. Debbie and I enjoyed a fun, cold and cramped ride with the harp, Robert, Topaz the dog and sandwiches in the back of the enlcosed pick-up truck. Laughing while carrying the harp across a snow covered field was typical of many happy times spent with Joe and Rita. Debbie and I are enternally grateful for the opportunities Joe and his colleagues at UNM provided to us. Joe in particular will always have a warm spot in our hearts. Joe was a role model as a human being, scientist, educator, and loving husband and father. We are grateful for the time we shared with him.